In Dallas County Texas, a killer is becoming a prolific one. Leaving mutilated and butchered bodies behind this killer of women has no boundaries and is always at least o e or two steps ahead of the police. 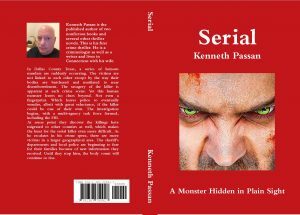 As he spreads to other counties in his killing, he continues to advertise the monster that he is. When police eventually realize who he really is’ they have to form a federal/task force to get him. But getting him proves almost impossible. The ending is an explosive one. Am a criminologist and forensics worker by academic expertise and experience. The characters were necessary because of the story and its character requirements. She never saw it coming. The whack to the head. The arm just as suddenly around her throat in an overly tight choke hold and dragging her back toward the kitchen. She tried to scream but the arm clenching her throat prevented that. She fought with all she could but he was just too strong, taller and more muscular.